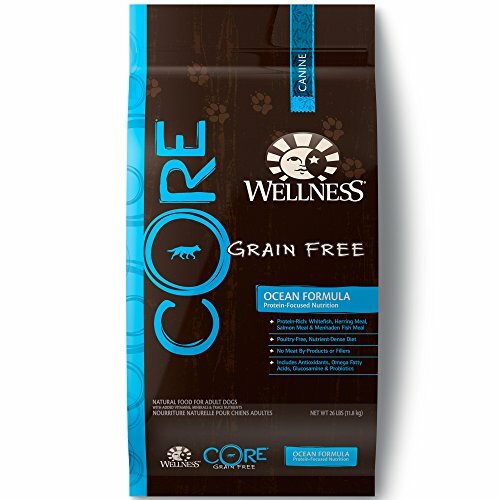 Wellness CORE Natural Grain Free Dry Dog Food Ocean Whitefish, Herring & Salmon Recipe is healthy, 100% natural poultry free, grain free dog food for adult dogs made with whitefish, herring, salmon, Menhaden fish meal and fruits and vegetables to help support your dog’s optimal health and fortified with antioxidents, probiotics, vitamins and minerals, including fish and flax omega blend for healthy skin and coat. Wellness CORE grain free dog food formulas are based on the nutritional philosophy that dogs thrive on a diet mainly comprised of meat. Each grain free, nutrient-rich formula provides high quality protein for your dog with no meat by-products or fillers, grain, corn, soy, wheat-gluten or artificial preservatives, colors or flavors.